Imagine installing an air conditioner that won’t send your summertime power bills skyrocketing. That’s the promise of new quantum dot infused windows. These tiny specks of semiconductor will enable windows to capture solar energy and generate clean power while remaining perfectly transparent. Power-generating windows: by adding nanosized quantum dots to windows, they become daytime power sources. Image from LANL. The new energy harvesting technology is called a luminescent solar concentrator (LSC) and could dramatically shift how we approach renewable power by, as just one example, turning windows into localized daytime power sources. LSCs work on the principle of collecting a large amount of incoming solar radiation and redirecting it to a relatively small area where it can yield useable electricity. The research involved herein was conducted at the Department of Energy’s renowned Los Alamos National Laboratory (LANL) and published in Nature Nanotechnology. 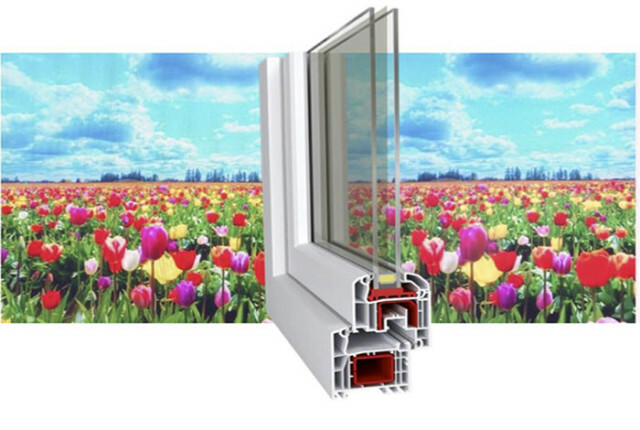 Led by Victor Klimov, it is the first to take advantage of quantum dots to produce a transparent and non-toxic LSC for power-generating windows. Quantum dots are nanosized semiconductor particles that display unique properties due to their small radius. The energy levels available for electron occupation become discrete, or quantized, which lends the particles their moniker. Of particular interest, the optical behavior of quantum dots becomes strongly dependent on the dot diameter as can be seen in the image below. This makes it relatively easy to synthesize quantum dots which manipulate light in very specific ways. In recent years, quantum dots have found myriad applications including medical treatments, solar panels, light emitting diodes, lasers, and quantum computation. 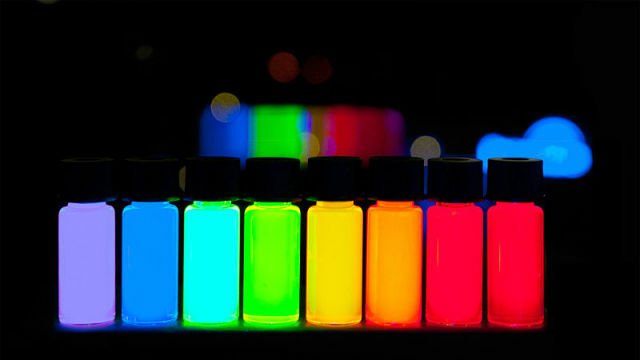 A rainbow of quantum dots: by changing the diameter of quantum dots, their emission color can be easily tuned. Image by Antipoff. In this case, scientists created quantum dots with the specific property of absorbing light at the frequencies of incoming solar radiation and re-emitting it at infrared frequencies which are invisible to the human eye. Window glass is then impregnated with just a small percentage of these nano-semiconductors and doctored with waveguides such that the infrared radiation is redirected to the edges of the windows where photovoltaics are waiting to produce useable power. As a further innovation, the quantum dots produced in this research were made without the need for any toxic heavy metals. Cadmium is a frequent component of quantum dots produced in research labs that renders them unsuitable for commercial applications due to a high toxicity that renders even trace amounts potentially dangerous. Using a complex combination of alternatives including copper, indium, selenium and sulfur, researchers were able to circumvent this problem making this technology adaptable to home use. The major hurdle in this work will be reducing the cost of the windows such that they compare with traditional versions and solar panels. Already this generation is significantly less expensive than previous iterations and a major component of the work was developing the industrial capabilities to produce actual windows with the new nanocrystals. How well will they work? Sergio Brovelli, another lead investigator, says that by replacing the glass on new skyscrapers such as New York’s One World Trade Center with LSC glass could yield sufficient electricity to power 350 apartments within. This is of particular interest in densely constructed areas like NYC where the ratio of roof-top to interior occupation is much too low to make traditional solar panels a reasonable option. Aside from power generation, LSC-doped windows will also reduce air conditioning costs by acting as filters of solar radiation. Says Brovelli, “you have a potentially game-changing technology towards "net-zero" energy cities”. Via Phys.org, Los Alamos National Laboratory and Nature Nanotechnology. Really? Self-Heating Food? Yes Indeed!